(Reuters) - A European Union parliamentary delegation urged Ethiopia on Wednesday to release journalists and opposition politicians jailed under an anti-terror law, and revise the legislation that critics say is used to stifle dissent. Ethiopian opposition parties routinely accuse the government of harassment and say their candidates are often intimidated in polls. All but two of the 547 seats in the legislature are held by the ruling party. Critics point to a 2009 anti-terrorism law that makes anyone caughtpublishing information that could induce readers to commits acts of terrorism liable to jail terms of 10-to-20 years. Last year, an Ethiopian court handed sentences of eight years to life to 20 journalists and opposition figures on charges of conspiring with rebels to topple the government. "We note flaws in the impartiality of the judicial system," said Barbara Lochbihler, who led the delegation to the Horn of Africa country. "Therefore we also call on the Ethiopian authorities to release all journalists, members of the opposition and others arbitrarily detained or imprisoned for exercising their legitimate right to freedom of expression, freedom of association, as well as freedom of religion and belief." Government officials were not immediately available for comment, but they often dismiss claims that they are cracking down on dissent. They say the law is needed to fight separatist rebels and armed groups they say are backed by arch-foe Eritrea. The delegation's visit came after thousands staged an anti-government procession in June in the first large-scale protest since a disputed 2005 election ended in street violence that killed 200 people. A smaller protest in the northern towns of Gonder and Dessie followed over the weekend, and opposition officials said dozens have since been detained ever since. The delegation said they were denied access to a prison where some of the journalists and politicians were being held. "We acknowledge and recognize the highly volatile situation of Ethiopia's immediate neighborhood," Lochbihler said. "However, when we look at the anti-terrorism legislation in this country, you think (about) how this legislation is implemented and being understood and being interpreted. This leads to a lot of arrests." Analysts say the opposition may have found renewed vigor since the death last year of Prime Minister Meles Zenawi, who was praised abroad for delivering strong economic growth but criticized for keeping a tight grip on power for 21 years. ADDIS ABABA, ETHIOPIA — A European Union parliament delegation on Wednesday called on Ethiopia's government to release jailed journalists and activists, but in a sign the call may not be heeded the delegation was denied from visiting a prison it had been approved to see. 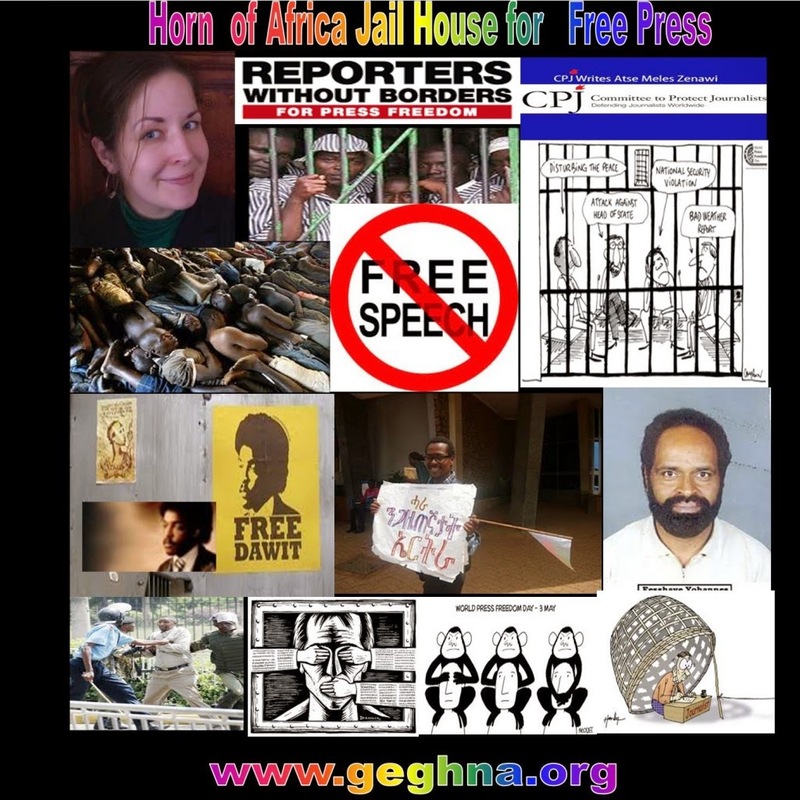 The head of the delegation, Barbara Lochbihler, said Ethiopia is jailing journalists and activists for "exercising their legitimate right to freedoms of expression, association and religion." The group is concerned by reports of misuse of the country's anti-terrorism legislation to stifle dissent, she said. "Despite the country's excellent constitution, we note flaws in the impartiality of the judicial system," Lochbihler told journalists at a press conference Wednesday. A spokesman for the Ethiopian Prime Minister said the country doesn't have any political prisoners and that prisoners would not be released "just because some European Union members said so." According to the Committee to Protect Journalists, the Ethiopian government criminalizes the coverage of any group the government deems to be a terrorist group, a list that includes opposition political parties. "Among those jailed is Eskinder Nega, an award-winning blogger whose critical commentary on the government's extensive use of anti-terror laws led to his own conviction on terrorism charges," the group said in its latest survey, which placed Ethiopia among the world's top ten worst jailers of journalists. The EU parliament delegation said certain broadcasters are jammed in Ethiopia and that access to the Internet and social media are "regularly restricted." The practice is at odds with the Ethiopian constitution, the delegation said in a statement. The four-person delegation, drawn from the parliament's subcommittee on human rights, said the Ethiopian government must guarantee freedom of speech and the right to peaceful assembly at all times in accordance with its constitution and obligations under international law. The delegation met top government officials, activists and leaders of the opposition. Earlier on Wednesday the delegation was scheduled to visit to the country's Kaliti prison where most activists are believed to be serving their sentence. But the prison director turned the group back on arrival, saying "he didn't have time to work with you," according to a member of the delegation, Jorg Leichtfried. Leichtfried told a news conference their visit was "overshadowed" by the incident. He described it as an episode he doesn't wish to experience again. All four delegation members spoke about the incident, which appeared to have frustrated them. The delegation said Ethiopia itself has requested international assistance to improve its detention centers and their visit was to have a firsthand experience of the detention conditions. Getachew Reda, a spokesman for Ethiopian Prime Minister Hailemariam Desalegn, said he was not aware of any decisions either to grant permission to see the prison or to deny it. Getachew said only family members can visit the prisoners. "We don't have any single political prisoner in the country. We do have, like any other country, people who were convicted of crimes including terrorism who are currently serving their sentence. They would only be freed when either they complete their sentence or probation on good behavior," Getachew told the Associated Press on Wednesday. "We are not going to do release anyone just because some European Union members said so." He criticized the delegation's statement, calling it "unhelpful" to relations between Ethiopia and the EU. The EU is one of Ethiopia's largest donors with millions of dollar spent on development projects across the country. Hailemariam was scheduled to meet the visiting delegation on Wednesday night. The European lawmakers also met with African Union officials. Lochbihler criticized Nigeria and the AU for allowing Sudanese President Omar al-Bashir to travel to Abuja earlier this week. The International Criminal Court has an arrest warrant out for Bashir.